Let’s touch on the basics of licensing and your options for equipping clients with licenses. If you’d like a graduate course, feel free to contact your favorite Intuiface Sales rep for assistance. Composer options are differentiated by feature set. Intuiface Composer, the editor, has a concurrent user license. You need as many licenses as you’ll have concurrent users (e.g. Intuiface designer) – that is, users working at the same time. Five people will use Composer but only one at a time? Then you only need one license. Here are the available Composer tiers and their duration options. NOTE: All Composers in an Intuiface account must be at the same tier level. Player options are differentiated by operating system. Intuiface Player, the runtime, has a concurrent device license. You need as many licenses as you’ll have devices running experiences in the field. Five devices will be running experiences at the same time? Then you need five licenses. Player for Windows (month-to-month or annual): For devices running Windows 7, Windows 8.1, or Windows 10, regardless of screen size. 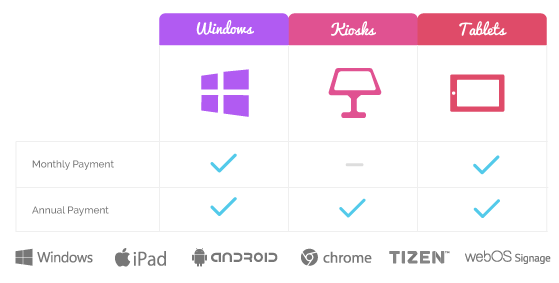 Player for Kiosks (annual only): For devices running Chrome, Tizen on the Samsung SMART Signage Platform, webOS for LG smart displays, and Android if not a consumer off-the-shelf tablet. Player for Tablets (month-to-month or annual): For the iPad (not the iPhone) and consumer off-the-shelf Android tablets. At all Composer account levels - Free, Essential, Premier, and Enterprise - Intuiface Composer and licensed Players can generate an unlimited number of data points. (Unlicensed Players cannot be used for data collection.) A separate Analytics plan - exclusively available for Composer Premier and Composer Enterprise accounts - determines the number of Players, the number of dashboards, and whether charts and dashboards can be white labeled. Is it possible to hide the fact that you’re using Intuiface? Remember, your Intuiface designs are always 100% yours. This means the only thing to white label is Composer and Player themselves. Well Composer can’t be white labeled. Sorry, not possible. Player itself cannot be white labeled either but you can hide it when launching an experience. Check out the white label option for Player for Windows and the post-to-store option for the iPad and Android devices. You can transfer your licenses to whomever you wish. This means it is not mandatory for your clients to buy Player licenses for themselves. It comes down to how you want to conduct your relationship with each client. You may choose a business model in which clients directly shoulder the license costs, or you may choose a model that bakes license costs into your services fee. Here’s a cool thought: If you make a multi-year pre-purchase of Player, you could actually charge each client a fee lower than the annual list price and still earn a profit! Whether your sell the license explicitly or hide it within a larger service fee, we recommend the use of secondary accounts for license distribution. See the next section. Juggling multiple clients, each of whom may have multiple projects, is tough enough without also having to juggle licenses, Players, data points, and more. We created the notion of secondary accounts to simplify your management of multiple clients and to limit client visibility to experiences specific to their project(s). We're sure you'll appreciate the benefits of secondary accounts so keep them in mind.